Et behageligt sted at leve for alle jer! To værelser til hvile og en komfortabel stue med en sofa til to yderligere personer til at sove der. Køkkenet er moderne og fuldt udstyret. Du vil være komfortable i det nye badeværelse. Endelig er der en stor balkon, som du får adgang til de tre vigtigste værelser. We have been to Paris many times but enjoyed our hosts, Christophe and Joel as one of our favorites. 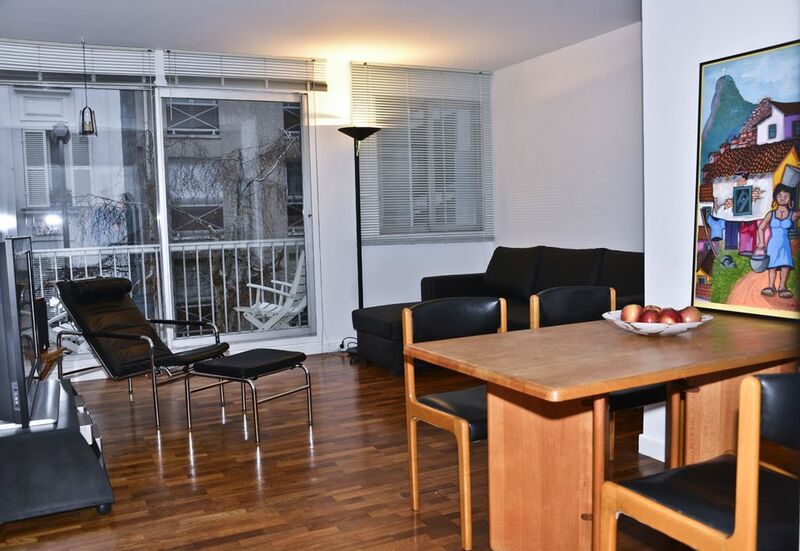 The apartment is a perfect location, close to the Metro,buses and of course the bakery and local supermarket. The apartment is clean and well kept. It was a delight to find a well stocked apartment with fruit, meat, cheese, eggs, milk and a nice bottle of wine. Joel walked the neighborhood with me to show us where everything was located for an easy transition. This will be the perfect apartment for you on your visit to Paris. It has been a pleasure to meet Margaret , her husband and Sherry. This is always difficult to give new tips to people knowing so well Paris . Our target has been just to show the apartment and the immediate surrounding , indicating the major shops for a good stay . 2 mal 5 Sterne und noch 2 obendrauf !!! Nos hôtes allemands sont juste exceptionnels par leur enthousiasme et sympathie .Enthousiasme pour la France dont ils connaissent toute l’Histoire , la grande comme la petite . Sympathie qui nous a permis de dialoguer agréablement et d’échanger . L’appartement est resté impeccable et je ne puis que recommander ces super hôtes pour les prochains séjours qu’ils feront en Province comme a Paris . Nous espérons les revoir tres vite . Je fais cette recommandation en français car ils viennent dans notre paus tres souvent et le connaissent parfois mieux que nous . A most wonderful place to stay!! Just as listed and we highly recommend this apartment in all ways! Our experience with staying at this apartment could not have been better!! The apartment is located in a safe and very nice area in Paris. It was extremely comfortable and we were so very pleased with both the wonderful accommodations, as well as all of our interactions with Christophe and Joel. When we arrived at the apartment we were met by Joel. He was so helpful in explaining everything about the apartment and then took us on a walk around the neighborhood to point out the grocery store, Metro and restaurants, all within about a block walk from the apartment. We were so pleased and surprised to find our apartment stocked with fruit, meats, cheese, wine, bakery items and everything we needed to get started. This was so wonderful to find at the end of our long travel. The apartment was super clean and well stocked with all of the supplies we needed. Christophe and Joel provided great information about some of the local events that we didn't know about and their suggestions were wonderful! They also were most helpful in teaching us about the cheapest and easiest way to get around Paris. The Navigo pass they suggested worked so well! They also arranged for our early morning taxi to the airport which helped our departure go smoothly and stressfree. We spent a couple hours visiting with Christophe and Joel, over wine and enjoyed so much, meeting and getting to know them! We would highly recommend this lovely apartment and will certainly enjoy a return visit!. Thanks so very much Christophe and Joel!! Deborah and Ervin ! Many thanks for your kind message . We have been so pleased to see you and spend a nice moment together drinking a good bottle a wine . A real good experience , hoping to see you again in Paris ! Appartement très agréable,confortable et très propre. Il y a tout le nécessaire pour passer un super séjour. Christophe est très accueillant et sympathique. Une adresse à conserver et à partager. Merci beaucoup pour votre commentaire Sophie . J’espere que vous avez tous fait un bon voyage de retour . Au plaisir de vous revoir . Well situated, light and bright apartment with a balcony . Very clean and very well equipped. If you want to spend some time in Paris then this apartment is ideal. Two good sized bedrooms with a living room / dining room, where you find a pull out bed (small double). A balcony runs along the length of the apartment which overlooks a residential street which, apart from the occasional moped, is quiet. The kitchen is ideal for a holiday apartment. Everything you will need is available and on arrival Christopher ensures that there are some essentials in the fridge. A very nice touch! Everything is clean - cutlery, plates, bowls, the whole apartment in fact. Christopher and Joel make perfect hosts and are incredibly helpful. Metro is close by, as are plenty of small supermarkets, bars and boulangeries. Overall a great place to stay and I would recommend this apartment and location. Thank you Christophe and Joel (and Marie) - you helped to make our stay in Paris enjoyable and memorable. Merciful beaucoup!! Many thanks for your kind comments . We have been very pleased to meet you and we hope to see you again in the future. The apartment has remained very clean and ordently . Many thanks for you visit . All the best . Truly amazing host: the owner really want us to spend a good time in Paris, helping us in every possible ways, like hop in to our car to ensure we find the nearest gas station. We felt warmly welcomed when we arrived, and missed when we left. The apartment could nicely fit our party of 6, very nicely renovated, it is clean and very functional. Very good location: close to subway and tramway stations: right besides the subway station exit, there is a small supermarket, a wonderful bakery. Highly, highly recommended for your stay in Paris. Very kind family coming from Hanoi and Vancouver . It has been a pleasure to exchange together as well for the arrival and the departure . We could also have contact every day through emails . The apartment has remained very clean and well ordered . We will be very pleased to see all members of this family , if they have the opportunity to come back to Paris ! Det er en populær og dynamisk område med masser af små butikker og et marked for frugt og grønt to gange om ugen. Det er tæt på Edith Piaf og mange andre kunstnere. Vi er tæt på byens centrum. Det er rart at gå rundt, besøge Pere Lachaise-kirkegården, nær. Jeg er sikker på du vil sætte pris på stor arkitektonisk mangfoldighed mellem bygninger, huse. Lejligheden er let tilgængeligt fra CDG og Orly, enten med taxa eller med bus eller metro. For togstationer Gare de Lyon, Gare de l'Est og Gare du Nord er alle Tres nærliggende metro. Lejligheden er virkelig 100m fra afgangen Place Edith Piaf "af Porte de Bagnolet.